Lancaster County stretches along the Rappahannock River at the southern end of Virginia’s Northern Neck. It hosts the charming coastal towns of Irvington and Kilmarnock, but is largely rural and economically disadvantaged. With high levels of poverty and teacher turnover, the school system has struggled with accreditation in recent years. But with provisional accreditation anticipated in the coming year, Superintendent Steve Parker is ready to shift the focus from literacy and math performance to deeper learning practices that will help prepare students for the new economy. 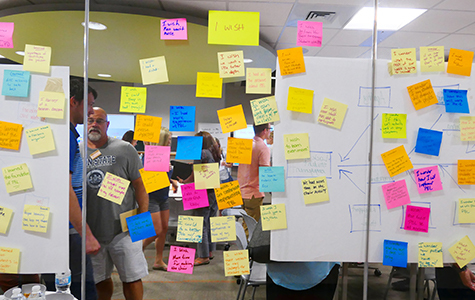 A new partnership between Lancaster County Schools and William & Mary’s Center for Innovation in Learning Design will help teachers and administrators reimagine their curriculum, incorporate project-based learning and inspire deeper learning. The project is possible thanks to support from the Jessie Ball duPont Fund, which is providing $75,000 in the first year. “Teachers are hungry for this kind of work,” says Lindy Johnson, assistant professor of English education. “Deeper learning means more engagement and more fun for everyone — both teachers and students.” Johnson co-directs the Center for Innovation in Learning Design with fellow faculty member Mark Hofer, professor of educational technology. 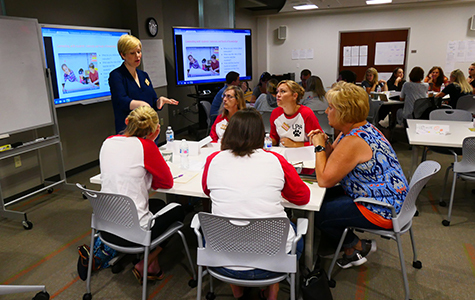 Lindy Johnson, co-director of the Center for Innovation in Learning Design, works with Lancaster teachers during the 2018 Summer Academy. The project is bringing a blended model of professional development to a cohort of 30 teachers during the 2018-2019 school year. Participating teachers began this summer with an intensive three-day academy on the William & Mary campus. There, they were introduced to deeper learning practices through the collaborative design of mini-projects which they will implement in their classrooms. Throughout the school year, teachers will continue to learn and collaborate through nine online modules developed by Hofer and Johnson. In addition, on-site coaching will further support teachers as they implement their projects in the classroom. At the end of the school year, teachers and students will present a division-wide public exhibition and celebration of the year’s work. Teachers in the first cohort brainstorm during the 2018 Summer Academy. During the summer academy, one third-grade team designed a “Nailed It Baking Challenge,” based on the popular tv show. Students will compete to make the best cake, learning fractions and other mathematical concepts along the way. “This kind of project creates a ‘need-to-know’ environment where students are motivated to learn. It’s more engaging and the learning is deeper,” says Johnson. The center plans to continue the project beyond a first year to reach more teachers in Lancaster County, and eventually to scale the model to other underserved school divisions with vulnerable populations.